Mr. Joseph Pararajasingham, MP, speaking. Mandur is 55 km southwest of Batticaloa town. There are more than 5000 families in the village and surrounding areas. A rural hospital has been operating in the village, and, Mr. Pararajasingham, who was the MP even then, laid the foundation stone for a maternity home in 1992. The provincial department of health services did not allocate sufficient funds for the home’s construction, and the project dragged on for 12 years, until its recent completion. Pregnant mothers from the village had to visit the Kaluwanchikudy hospital, 25 km away, or the Batticaloa teaching hospital, 55 km away, for medical care and delivery. 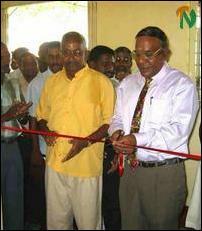 DR. S. Kumaravetpillai, the PDHS, declaring open the maternity home by cutting the ribbon. On left is Mr. Joseph Pararajasingham, MP. Mr. Pararajasingham was the chief guest at the opening event Saturday, which was presided over by the former President of the Mandur Murugan temple and retired principal, Mr. V. Gunasundaram. 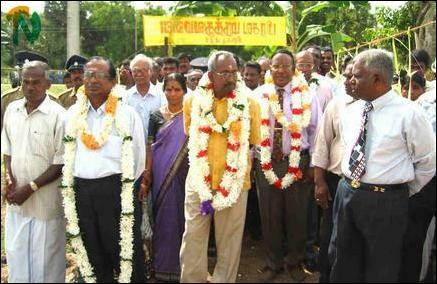 The Provincial Director of Health Services (PDHS), Dr. S. Kumaravetpillai, the Deputy PDHS, Dr. W.W. Williams, former MP, Mr. Pon Selvarajah, the leader of the LTTE’s Batti-Amparai health division, Mr. K. Selvakumar, Mavadymunmaary political leader, Mr. Sutha, Mr. K. Karunaharan, the Vellaveli divisional secretary, the pastor of the Mandur Church, Mr. Ravi Murugupillai, Medical Officer of Health, Dr. S. Krishnakumar, and the Pirncipal of Thambalavathai school, Mr. T. Jeyaratnam, also spoke at the event. 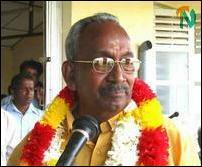 The MP said that it was due to the LTTE’s ceasefire that the people could find relative peace now. “Through the agreement signed by our national leader, V. Pirapaharan, and the Government of Sri Lanka (GOSL), there is peace now. But the people are worried about the current political climate in the south,” he said. Mr. K. Karunakaran, the Vellaveli divisional secretary, unveiling the name board. Alluding to Kumaratunga’s alliance with the ultra-Sinhala nationalist and Marxist Janatha Vimukthi Peramuna (JVP), the MP said, “The JVP has been campaigning against peace and the agreement between the LTTE and GOSL. The Sri Lanka Freedom Party’s [SLFP, party of Kumaratunga] alliance with the JVP can only be a setback to peace. But the international community has been pointing out that whatever party comes to power in Sri Lanka will have to negotiate with the LTTE. “At a time when even super power nations are coming forward to negotiate with the LTTE to bring peace, some chauvinist elements are raising false charges and carrying on a propaganda against the LTTE. Members of the public, and the Rural Development Committee members also participated. An expectant mother was admitted as the first patient to the Maternity home. Mr. M. Sangaralingam proposed the vote of thanks. Guests garlanded and taken in a procession. (L-R) with garlands are Mr. Pon Selvarajah, former MP, Mr. Joseph Pararajasingham, current MP, Dr. S. Kumaravetpillai, PDHS, and Dr. W.W. Williams, DPDHS. 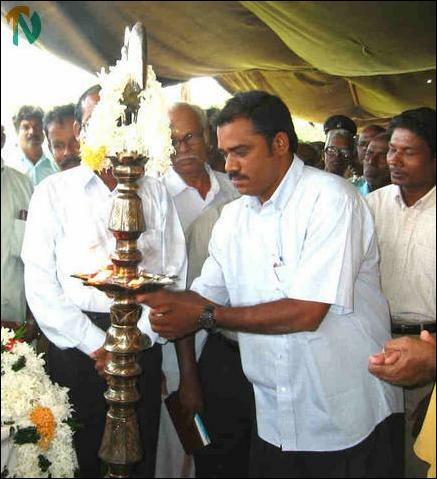 The head of the LTTE's Batti-Amparai Health division, Mr. K. Selvakumar, lighting the traditional oil lamp.